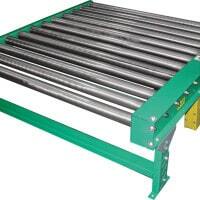 At Ingalls Conveyors, we manufacture, design, and re-manufacture pallet handling conveyors. 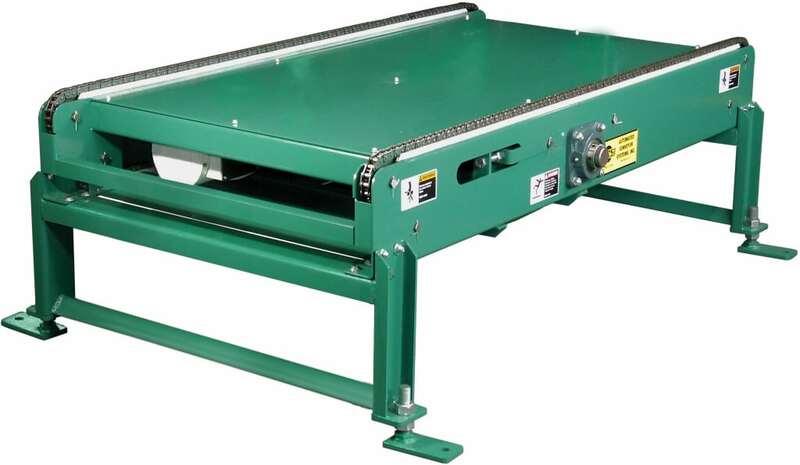 We are also a direct distributor for several major conveyor manufacturers and have the unique ability to save our customers a substantial amount of money by integrating new pallet handling conveyor components with refurbished pallet handling components as appropriate. 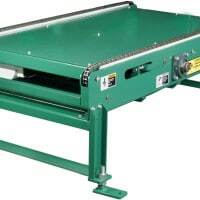 Our refurbished conveyors come with an “AS NEW” warranty. 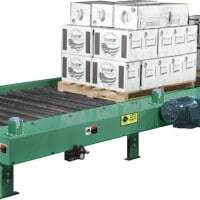 Please call 1-800-826-4554 or email info@nullingallsconveyors.com to contact one of our engineering staff members about your specific pallet handling conveyor requirements. Motor – 3⁄4 HP 230/460-3-60 TE motor. Frame – Heavy duty 7″ deep x 4 gauge powder painted formed steel channel with heavy duty cross braces. Frames are bolted together with splice plates and floor supports. Rollers – 2-1/4″ diameter x 11 gauge steel rollers, grease packed and labyrinth sealed bearings, 11/16″ hex shaft. Rollers are spaced on 4″ or 6″centers, set 2-1/4″ low. Floor Supports – Adjustable 18-3/4″ to 23-3/8″ (HD-4) from floor to top of roller, for each end of conveyor and at each bed joint along with knee braces for each support. Supports on 5 foot centers, changes with zone length. Drive – Located near center of conveyor length, shaft mount motor and reducer. Drive Chain – RC #40 chain used for roller to roller connections, RC #60 chain drives each zone. Chains are totally enclosed by metal guards. zone is driven by an air clutch and controlled by a photo eye sensor. Motor – 3/4 HP 230/460-3-60 TE motor. Electrical Controls – 120 VAC input to power supply. 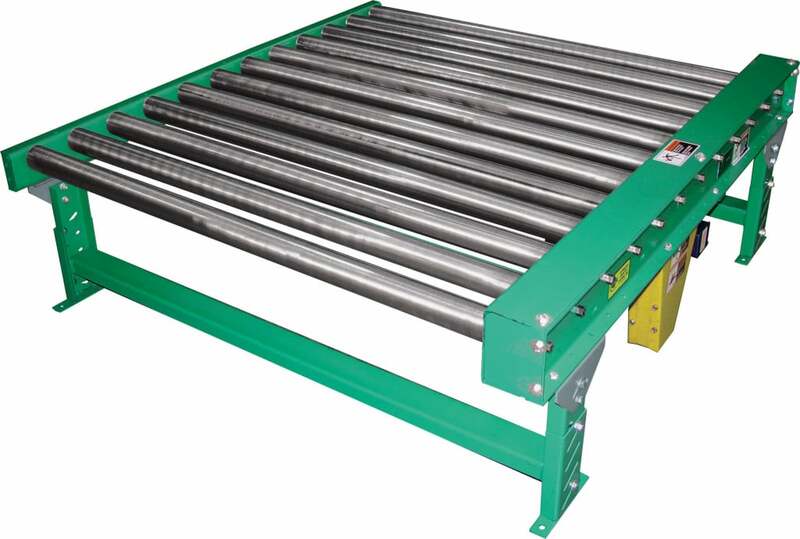 Conveyor Speed – 30 FPM constant roller speed. Capacity – 4000 pounds maximum unit load. Total conveyor live load not to exceed Load Capacity Chart (see catalog page). Speed Reducer – Heavy duty, sealed worm gear, C-Face. Bearings – Sealed pre-lubricated with cast iron housings. Sensing Device – NEMA 1 photoelectric sensor in each zone detects presence of product and activates accumulation feature in trailing zone if upstream zone is occupied. Frame – 9″ x 7 gauge powder painted formed steel channel frames. Sections are bolted together with splice plates and floor supports. Chain – (2) 60F single pitch conveyor chains, straight side bar, on 36″ centers. Floor Supports – 24″ to top of chain. One support supplied at each end of conveyor and at each bed joint. Motor – 1 HP 230/460-3-60 TE motor, C-Face. Motor and speed reducer are located underneath conveyor frame. Speed Reducer – Heavy duty worm gear for C-Face mounted motor. Sprockets – Hardened sprokets with 1-15/16″ diameter CRS drive shaft. Bearings – Sealed, pre-lubricated with cast iron housing. Speed – 30 FPM constant speed. Capacity – 10,000 lbs. maximum distributed live load at 30 FPM. Maximum motor size is 3 HP.